Choosing the best scratching post for your cat can be a frustrating and expensive endeavor. You may end up buying several cat posts that your cat virtually ignores and won't deign to scratch. Instead, he marches on up to his favorite "scratching post"—your couch. You may decide that your cat just doesn't like scratching posts, but that is seldom the case. One of the mistakes people make is that they choose posts that appeal to them, the humans, rather than thinking about what appeals to the kitty. A little knowledge goes a long way in finding the right scratching post for your cat. The trick is to provide an alternative that your cat will love to claw even more than your antique dresser—but that requires you to choose a post from your cat's point of view. Here are the main characteristics your cat is searching for in a good cat scratching post. We'll explore each point further in the sections below. 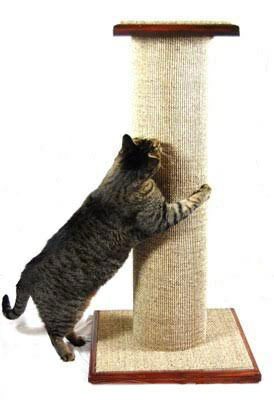 The scratching post should be tall enough to allow your cat to fully extend while scratching. This means that your cat can stretch his body out fully and pull those back and shoulder muscles, which is important for health and flexibility (cats are masters of yoga). If cats have to crouch down to scratch, they won't get the full benefit of exercising and stretching those muscles, and it may even be uncomfortable for them. Note: Often, cats will hunker down to scratch and not fully extend their body. This is just another position that exercises different muscle groups. The important thing to remember is that your cat needs to be able to scratch in any preferred position. Choosing a cat scratching post that is at least 31 inches tall is a good start toward making your cat happy and saving your furniture. 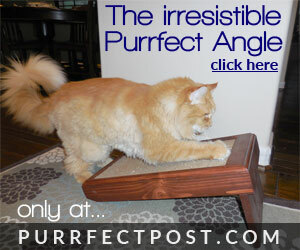 If the post wobbles, your cat won't use it. This is one of the reasons cats love to scratch couches and chairs—they are extremely stable. In the wild, trees are preferred scratching surfaces, so you can understand why cats would be looking for an unmovable object. If the post is wobbly, it might be unsafe—and your kitty knows it. An unstable scratching post may flip over and fall on your cat. You can be assured that if your cat topples over a flimsy post, it will be dutifully avoided in the future. The taller the post, the sturdier it needs to be. Cats can be injured or killed by a large, unstable scratching post falling on them. Look for posts that have extra-heavy bases, preferably double-thick. A thin, lightweight base and a top-heavy post is a recipe for disaster. When looking at cat scratching posts, you will find a dizzying array of materials. Many are designed to be attractive to humans. Unfortunately, most of these sit unused, as they aren't attractive to cats. Cats prefer a sturdy material that shreds under their claws. Studies show that, in nature, cats like to mark their territory with long shredding marks. Your kitty's primal urges still dictate this preference. Plus, shredding is fun. Ever have a cat shred your papers? Cats also like an accompanying loud noise while scratching—it seems to be more satisfying. Try to avoid cat scratching posts covered in carpet. Many cat scratching posts are covered in a variety of carpeting, and cats sometimes like those. However, it's important to choose a post with a covering that is different from the material in your home that you want to persuade your cat not to scratch. The reason for this is that your cat won't understand why it's OK to scratch some carpeting in the home but not the rest. Plus, carpet does not always provide the most satisfying scratching surface. It isn't rough enough, and the loops tend to catch claws and yank on toes. Sisal fabric is a great scratching surface. Sisal fabric material is heavy-duty, feels great to cats, and shreds under their claws in a pleasing way. Remember, an important component to your cat finding a scratch satisfying is the ability to shred the material. Sisal rope versus sisal fabric for cat scratching posts. Sisal rope is used on cat scratching posts, but cats really do seem to prefer sisal fabric, which allows for better shredding. Cats can easily draw their claws down the fabric, yet still get a good grip. The texture and resistance feel great to the kitty's paws and claws. Sisal rope does not allow for a continual vertical shredding motion. Instead, the cat experiences interruptions due to the wrapping of the rope. The kitty starts to draw down his claws and is interrupted by the ridge between the layers of rope. Scratch, bump, halt, scratch, bump, and halt: this does not equal a satisfying scratching experience. 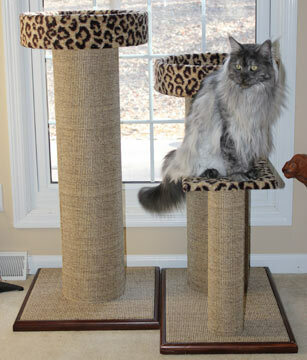 Learn more about in "Sisal Fabric: The Best Material for Cat Scratching Posts." Another great material for scratching is heavy corrugated cardboard. Like sisal fabric, it also has a pleasing feeling. Plus it makes a great noise when scratched. Cardboard is often found in flat and angled cat scratchers. They tend to be sturdier. Remember, a critical factor in your cat's enjoyment of a post is stability, both for your cat's preference and for his safety. Tall posts made out of hollow tubes and covered with sisal fabric are preferable to top-heavy wooden posts that might topple over. Don't forget to look for a double-thick base to ensure the stability of the post. They make more noise when scratched. This is highly satisfying to cats. You've probably noticed that cats like to stretch up and scratch vertically, such as on sofa arms and door jams. They also like to scratch horizontally, as when they claw areas of the carpet. Therefore, when searching for the cat scratching post that your cat would choose if he could, it's good to incorporate both directional surfaces, which usually means providing a couple of different scratching posts and pads. 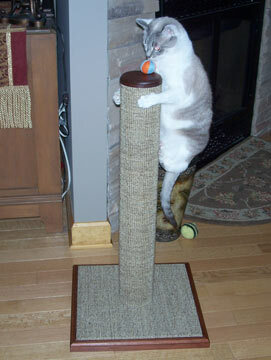 A good idea is to have a vertical (tall) cat scratching post and a horizontal (flat) or angled cat scratcher. The post should be covered in sisal fabric (material, not rope), and the flat or angled scratcher should have a cardboard insert for a different texture and experience. Providing a multipurpose scratching surface that also works as a perch from which your kitty can survey his domain, both inside and outside, is a great idea. A good, sturdy, sisal-covered post that has a place for your cat to lounge will not only satisfy your cat but will also help protect your furniture. Think about, in nature, how cats like to perch in trees that are "their" trees. They have marked them as their domain, and they have a great view of what is going on in their territory. A couple of examples of great posts are here: Purrfect View and the Mondo!. One thing that we need to ensure with all of our pets is that they have plenty to keep them occupied and interested. Boredom is not fun and is not something we want any of our pets to experience. 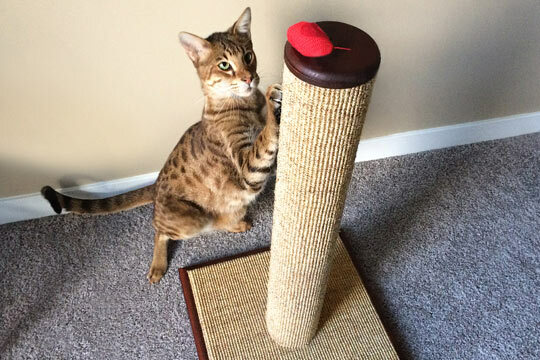 When choosing cat scratching posts from your cat's point of view, keep in mind that he is interested in experiencing a good scratch and having fun. Choosing multiple different posts and a variety of materials will keep your cat busy and happy. Helpful hint: Put a post with a pedestal (place to perch and sleep) in front of a window for entertainment—and maybe a little bit of sun. Placing a cat scratching post with a horizontal platform on top in front of a window will allow your cat to scratch vertically, climb, scratch horizontally, sit and watch the action outside, and take a nap on a perch. A purr-fect way to satisfy your kitty's desires and needs. Check out the Purrfect View. A cat scratching post can be moved near different windows in the home so your cat can watch something new. Another easy way to keep things interesting for your cat is to provide some angled cat scratching posts in surprising places. These posts give your cat a third, angled position to scratch from, and they are made from corrugated cardboard. Angle scratchers provide a different scratching position that helps stretch and work even more muscles. We find many cats scratch backward—meaning their front claws are at the bottom of the angle, their rear ends toward the top. Being able to scratch in both positions is not only entertaining for your kitty but also provides health benefits. Helpful tip: When purchasing an angle scratcher, buy a few extra cardboard inserts to stash in hidden places for your cat to discover. Cats LOVE to discover things. Discovering an angle scratcher under the bed or in the corner of a closet is interesting and fun for a cat. These are also common places to find that your cat has scratched your carpet, so this strategic placement does double duty. It's easy to choose cat scratching posts that your cat will love when you put yourself in his paws and look for what he likes!